On May 21st Manhattan’s finest ensemble of wind musicians, under the direction of Sarah Quiroz, returns to the stage to present a program that will transport you around the world and then some, with original wind band compositions and transcriptions from nearly every corner of the earth. 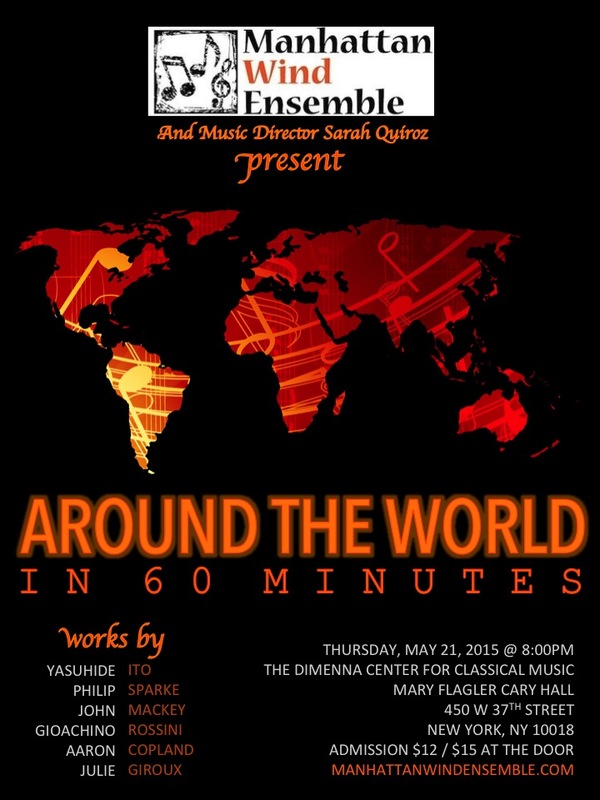 So if you’ve never been to the Grand Canyon, or can’t find the time to make it to Japan, MWE’s “Around the World in 60 Minutes” is the next best thing. Possibly even the best thing! You can purchase naming rights to individual sections of the band! The name you choose will be affixed to your section for the entirety of the 2015-2016 season, and you’ll basically be treated like minor royalty whenever we see you. (NOTE: section sponsorships do not come with a concert ticket).